The styling has lots of elements taken from the Infiniti QX Inspiration concept and Nissan IMS concept. The luxury division of Nissan, Infiniti has released an image of its new sports sedan concept, which will debut at the 2019 Shanghai Auto Show. 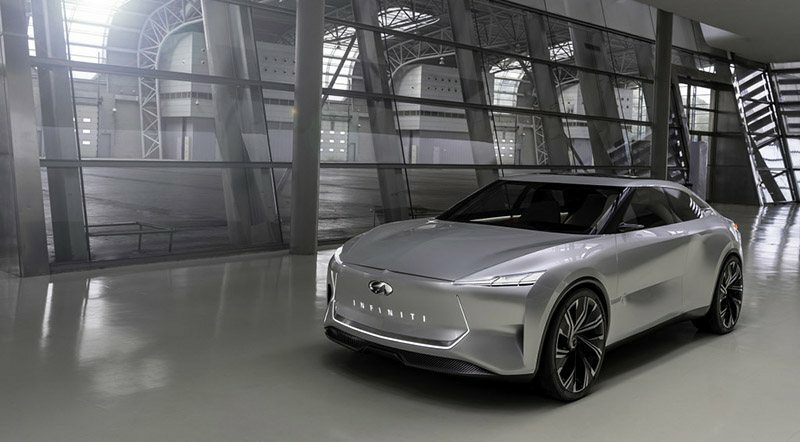 Called the Infiniti Qs Inspiration Concept, it looks similar to the QX Inspiration Concept, which the automaker revealed at the 2019 North American International Auto Show. The image shows a broad front face without a grille. The thin LED headlights have a flash of chrome with “INFINITI” inscribed under the company’s logo. With no image of the rear end, we assume it will feature a thin LED strip across the whole length. The styling has lots of elements taken from the Infiniti QX Inspiration concept and Nissan IMS concept. The automaker didn’t reveal any image or info about the interior but we expect it to have an elevated driver seat and tall door sills owing to its similarity with the QX Inspiration. The Infiniti Qs Inspiration concept will have an electric powertrain; however, the exact specs are unknown right now. Expect to have at least two electric motors powering all the wheels and batteries sitting on the floor for improved aerodynamics. With Infiniti looking to transform into an electrified automaker, we expect to get its first fully electric vehicle in the next two years. This could be a crossover SUV with 400 horsepower and around 300 miles of range. Depending on how crowd receives it at the Shanghai Auto Show, we anticipate seeing the production version of the Infiniti Qs Inspiration in the next five years.